Every now and then you come across a fabulous book that really gets your kids motivated to learn a new skill and head outside for an adventure. It just so happens that I came across such a book and just in time for Christmas! Why Not Knot for Fun?! is a gem of a book with step by step guides and pictures to show your kids (or even you!) how to make 12 knots and to put them to use. I expected my oldest kids to be the most intrigued, however Willow (11yrs) and Rose (8yrs) really took an immediate interest to this book. They spent a couple of hours learning several knots and by lunch time they could make a few without looking at the book. After you master a few of the knots, there is an entire section that teaches you some uses for the rope and the knots. For example it gives details on how to tie up a bedroll, make a backpack from a t-shirt, build a gear harness to hold all of your adventure gear, and how to create an outdoor shelter. Indiana really liked the section on making a bow and arrow with sticks and, of course, your rope! There is also a section that gives instructions on making a simple board swing, a log swing, and a tree platform for a tree house. We affectionately call this book our Hunger Games prep book!! In the top corner of each page there is a small legend that states what knot you will use for the activity or project on that page. We have a small wooded area behind the house and have watched our children create all sorts of structures, make up elaborate worlds, and spend hours outside using and growing their brains! 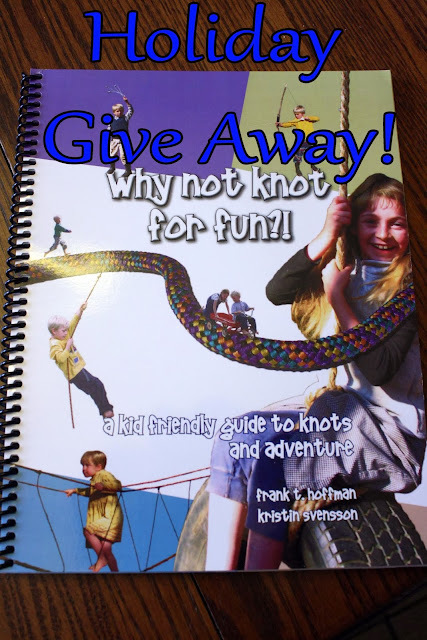 My husband joined in one day with his old climbing rope, something he's had since he was a kid and uses often for various projects as an adult, and the idea of a knot tying adventure book was born. Knot tying is more than just a practical skill. It develops spatial aptitude, encourages creativity, builds structural engineering skills, and so much more! There is nothing more thrilling for a child than to build their own tree house with wood or lumber and some rope. Or a swing, or a tent, or to help Daddy tie down a load. Knot tying and creative play builds confidence and independence. We know. We've seen it in our own children! Why Not Knot For Fun?! teaches the tying of a dozen practical knots and reinforces those knots with more than 30 project ideas that range from simple belts to an elaborate adventure course. Frank & Kristin Hoffman live with their 5 children in the hills of East Tennessee where they farm and create new adventures with their children on their 40 acre homestead. Why Not Knot for Fun?! has been a wonderful activity guide for my crew these last several days! The book is not only an excellent teaching book, but it would also be a great Christmas gift! I try to avoid the crap-plastic gifts as much as possible and I think this book with a length of paracord would be ideal! I will be giving away ONE copy of this book to a lucky reader! There are THREE ways to enter this giveaway! 1. To enter, simply leave a comment telling me if you would keep this book for your own kids or give it as a gift! 2. You can get a another entry by stopping by My Barefoot Farm on Facebook and giving the page a *like*. If you already *like* the page, just post a quick line *book giveaway*. 3.If you *share* the contest on Facebook I will enter you again, just let me know on My Barefoot Farm's Facebook page that you shared this post! Entries must be in by Midnight Saturday (EST). I will announce the winner Monday, Dec. 9th. Of course, this book is available for purchase now through Amazon. Go ahead and buy it for your favorite child, boy or girl! You can also get some paracord from Amazon to go along with your book gift. You can also go to the knot for fun website and see a little more about the family and the adventures behind the book! If I won the book, I would use it for my kids and in my homeschool co-op class! This looks like so much fun. I love the pictures of your projects! If I won I would give it to my children. My two older boys would love to do this. They are always coming up with some adventure that they need rope for and this would be perfect for them. I could use it too...I'm terrible at tying knots! We have 3 boys and a daughter who we homeschool and would LOVE this book. Especially our 8 year old son ! Thanks for taking time to do this giveaway! Would be a great gift for our girls! Win or knot looks like this needs to be under the tree! If I won, I would totally keep the book for my boys! My boys do knot knot yet. I do knot know if they will, but we do knot want to pass up this opportunity! My 6 year old son would love this! I'd love to give it to him. Would love to win this for my son! He always wants to go to the feed store with my husband to buy lengths of rope with his allowance!! This looks great! My sons wold love it! I'd use it with my so, Jacob. This would be a great activity to do with my 9 year old sons! They have been making paracord survival bracelets recently so this would be right up their alley. I may have to buy a copy if we don't win one!